Circle up, Alice in Wonderland fans! 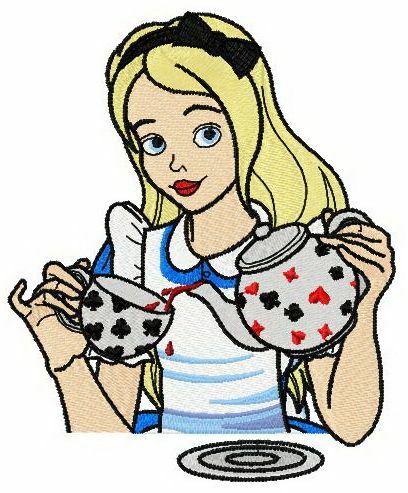 This amazing machine embroidery design is a tribute to lovely Alice who’s getting ready for teatime. The girl is wearing a blue and white frock and there’s a black bow in her blonde hair. Alice is holding a teapot and a cup decorated with hearts, clubs and spades. The color choice includes oriental blue, saffron, redberry, flesh and pale yellow among others. This creative needlework will be such a lovely addition to a whole lot of your favorite things, ranging from T-shirts, hoodies, pajamas, towels, bathrobes, blankets, napkins, cushions, quilts and more. Earn 623 points for purchasing this product.